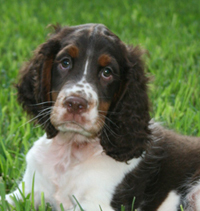 Are you looking for an English Springer but don't want to go through the trials and tribulations of puppyhood?. Then consider getting a Rescued Springer. Fact: Great Dogs with Great Temperaments end up in the rescue program. Every year wonderful dogs end up in rescue programs and these dogs make great companions. 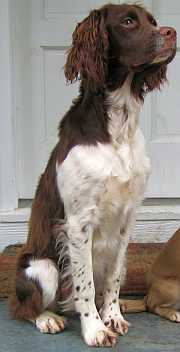 Rescue organizations such as English Springer Rescue America (ESRA) take in dogs that no longer have a home. They take care of any medical needs the dogs may have, then place them in foster care until the right "forever" home comes along. While we don't always have much history for these dogs, the foster families work with each dog and assist in evaluating the dogs in their care. In this way, the dogs can be matched with the best home, be it an active one or a quiet one. 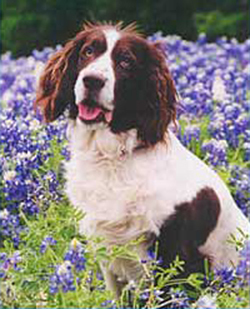 To see the dogs available in Texas, visit English Springer Rescue America (ESRA). This site will also link you to an adoption application form. Are you thinking of placing your Springer? Dogs are given up each year for many reasons, but if you are having behavioral problems with your dog, please take a look at Wonder Puppy. This web sites has excellent information about how to work with your dog so that you may be able to keep it. In addition, the links below provide comprehensive information, answers and solutions to problems that are often given as reasons for relinquishing a dog. You may find the solution you are looking for that will enable you to keep your Springer.